In early August 2010 my wife and I joined my sister and mom for a week-long Costa Rica tour. This wasn't a focused herping trip; we were part of a general natural history tour with (the highly recommended) International Expeditions. 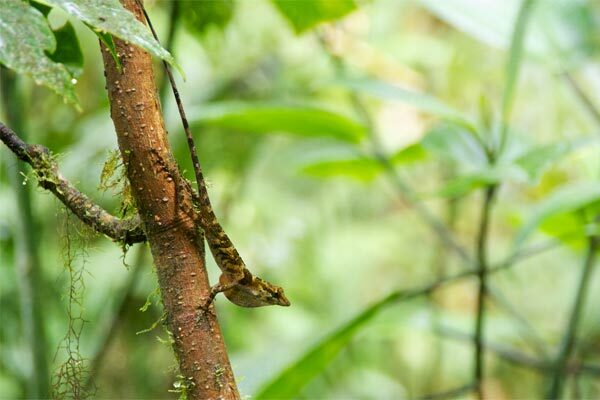 But fortunately there are so many herps in Costa Rica that you can't help but seeing some good ones even when you're spending valuable herping time looking for monkeys, sloths, toucans, quetzals, jaguars, yeti, etc. 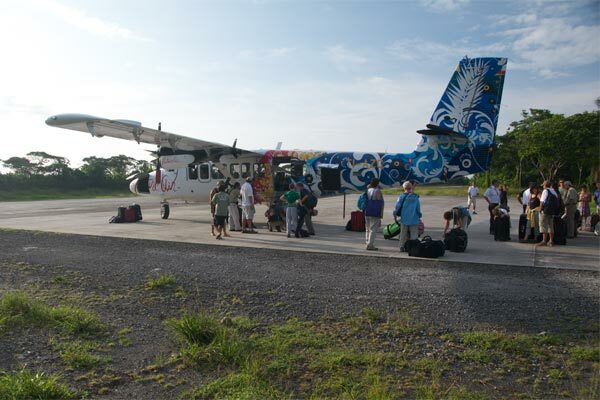 We started by flying into San José on a big dull plane one day, and then from San José into Tortuguero on a small colorful plane the next day. 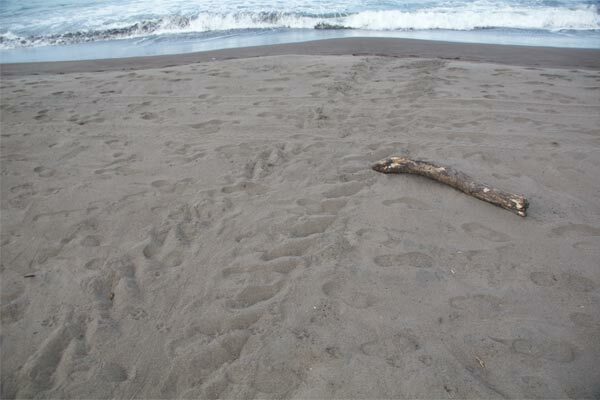 As we neared the Tortuguero airstrip, we passed over the famous beach where all the sea turtles lay their eggs. 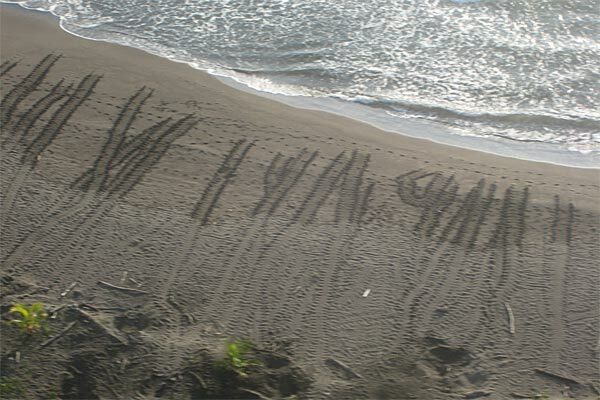 This photo, which my wife took from the plane, shows the density of nesting turtle tracks. There weren't too many herps around our lodge, but there were a few. 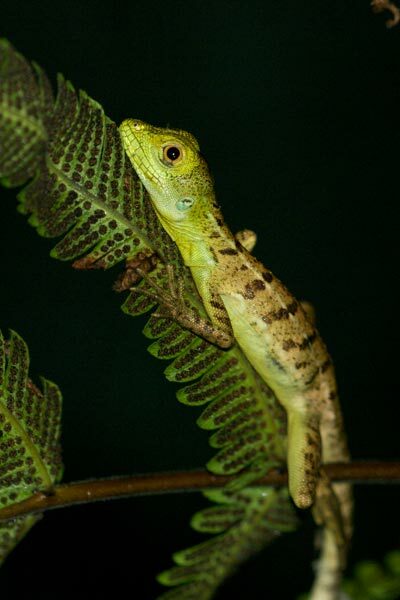 The most common were Slender Anoles (Anolis limifrons). 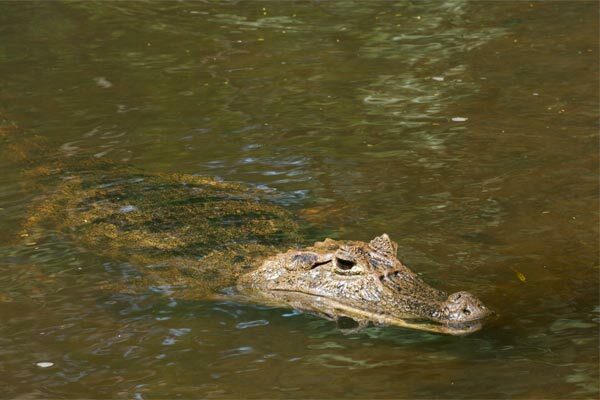 A friendly Spectacled Caiman (Caiman crocodilus) had taken up residence near the lodge's dock. The staff had named it "Tosty", perhaps after a popular brand of Costa Rican snacks. Staff members claimed that they did not feed Tosty, but Tosty was very, very fat. I am not sure that I believe the staff members. 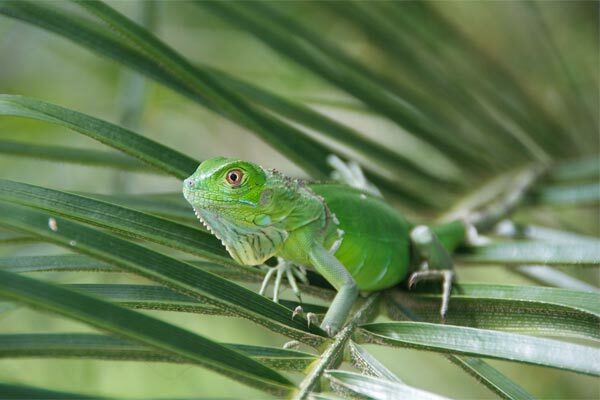 A small palm that leaned over a couple of lounge chairs near the lodge's pool was home to a pair of baby green iguanas (Iguana iguana). 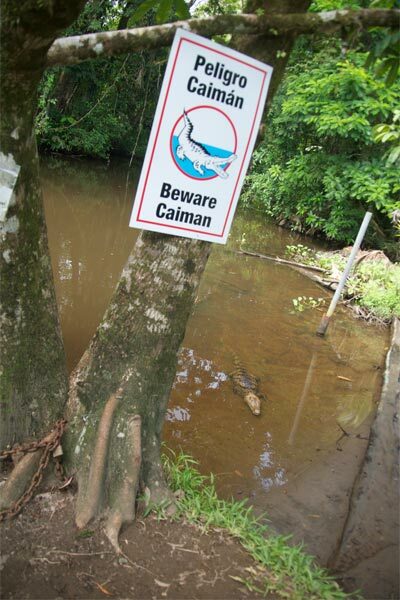 I had been to Costa Rica a couple of times before, but never to the Caribbean side. The herp I was looking forward to most lives mainly on the Caribbean side. 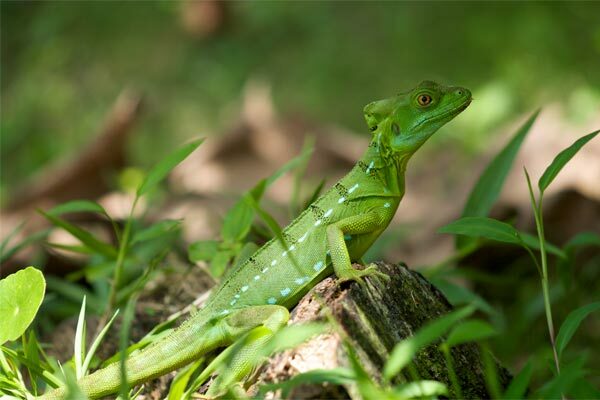 And on our first morning, my sister spotted one as we wandered about the lodge grounds: an Emerald Basilisk (Basiliscus plumifrons). 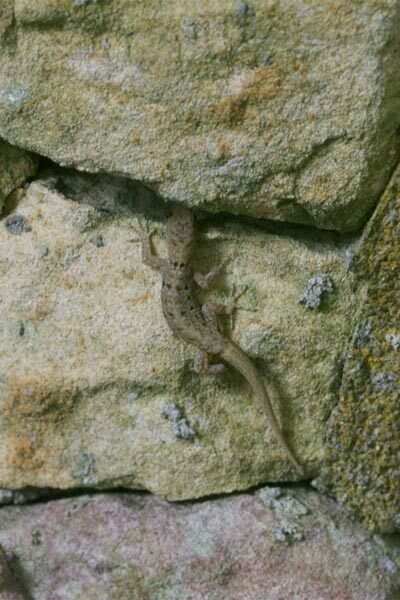 This one was an adult female &emdash; a large, beautiful lizard, but without the crazy dinosaur appearance of the male. 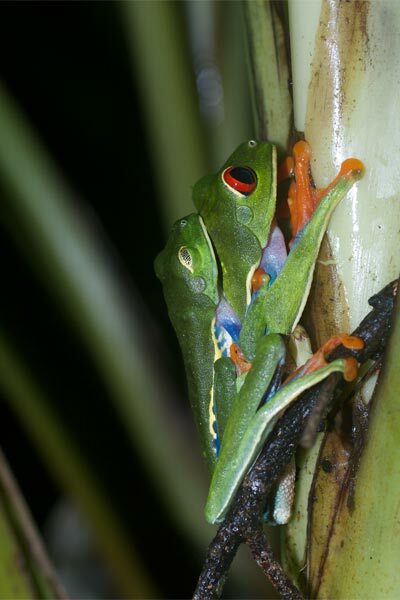 The trip's first frog was this Red-webbed Treefrog (Hyla rufitela), which is certainly showing off its red-webbedness. In the afternoon we briefly visited Tortuguero village and beach. There we saw some more turtle tracks up close and personal. In the evening we went back out to the beach to try to see nesting turtles in action. The authorities are very careful to prevent tourists from disturbing the turtles, and there are a bunch of rules involved. One of the rules is that no cameras are allowed, so you'll just have to take my word that we saw no egg-laying turtles, but we did see two turtles heading back out to sea, and we saw a third turtle lug itself out of the sea and across the sand until it swiped its huge leathery flipper across my arm, whereupon it turned around and lugged itself back out to sea. 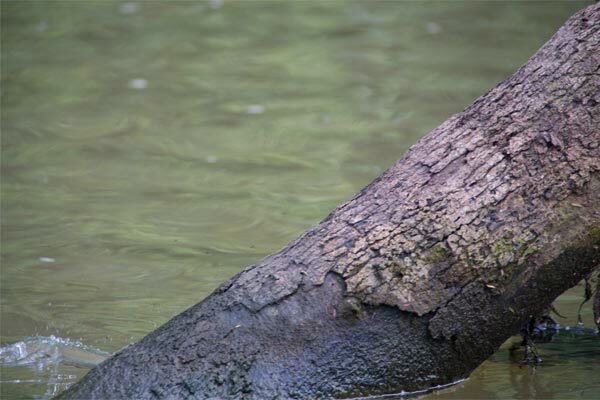 I felt a little guilty, but if I hadn't been sitting there the turtle would have run into the log that was two feet further inland, and presumably turned around there instead. 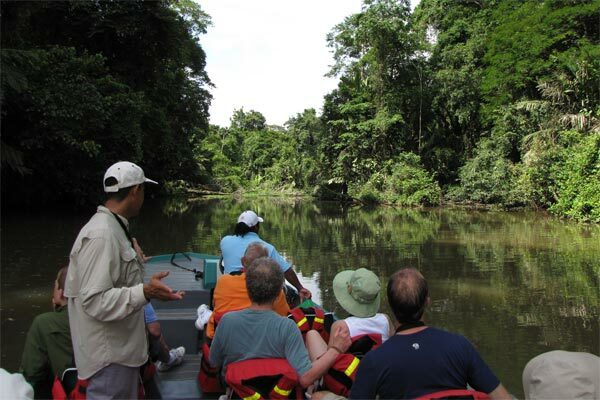 We spent some time on the rivers and channels of Tortuguero National Park. Our trip guide was Jonathan Sequeira (standing), a first-class naturalist who could not only name but also describe in interesting detail the natural history of pretty much every animal and plant that we encountered. 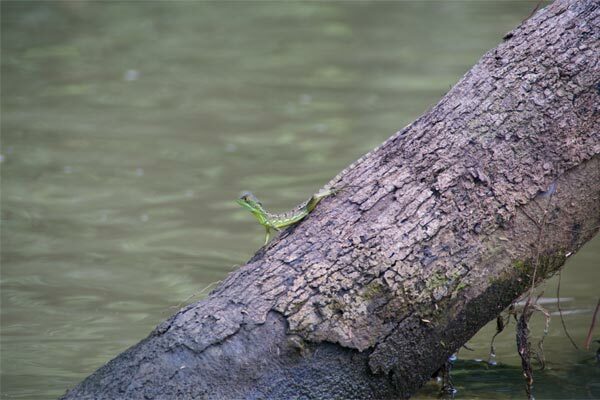 Here's another Emerald Basilisk; this one is a youngster that was poised alertly on a partially-submerged tree trunk until we got a little too close. Now you see it, now you don't. 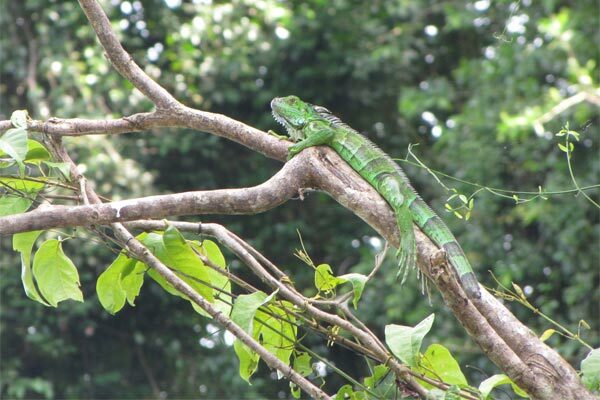 A big green lizard in a tree (Iguana iguana). 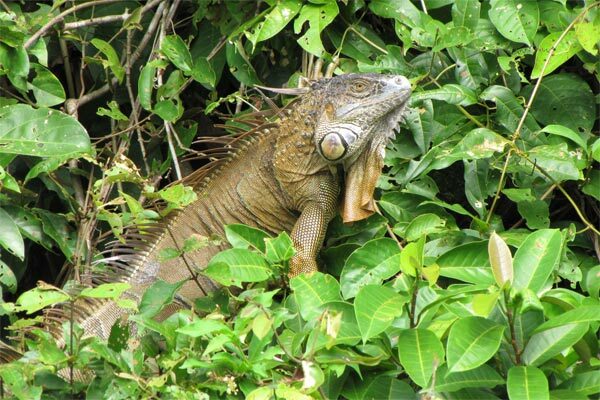 A big orange lizard in a tree (also Iguana iguana). 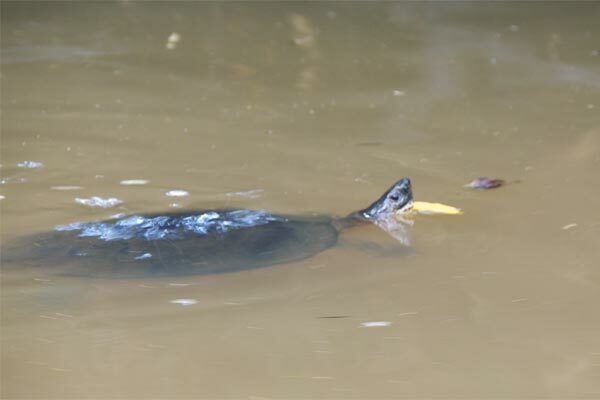 We saw a few Black River Turtles (Rhinoclemmys funerea). Some of them were basking on the riverbank when first sighted, but they dropped into the water quickly as we approached. 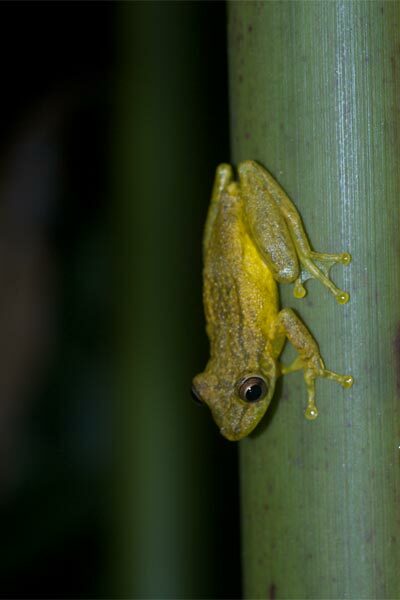 Here's another Hyla rufitela that was minding its own business on a big palm leaf until we pulled up and took turns capturing its image for posterity. It was still in the same position when we left, but I think its eyes were much wider open than they had been. 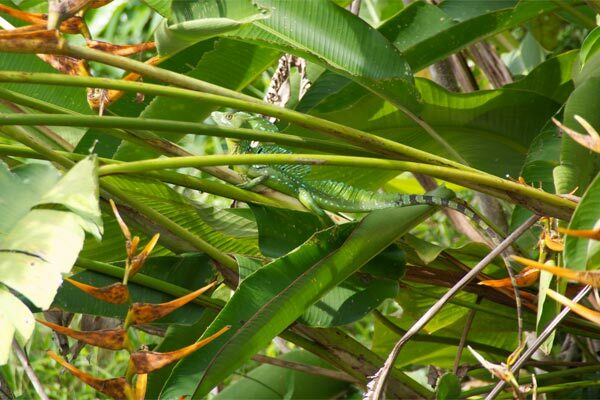 Somehow our boat captain spotted this basilisk in the foliage along the river's edge. We were suspicious that he knew it was there from a previous day, but Jonathan assured us that our suspicions were unfounded in this case. I was very happy to finally see a big adult male, but I was still hoping to photograph one that wasn't so obscured. 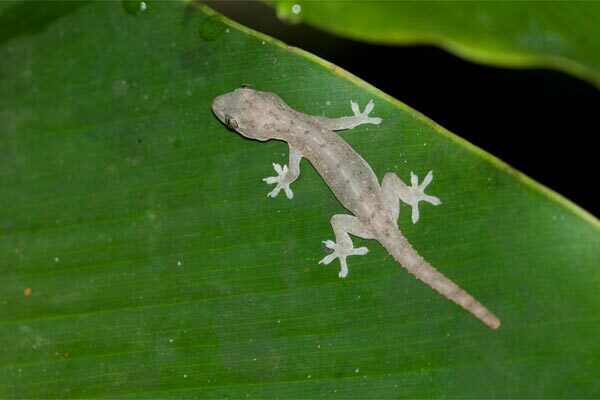 We found a few herps around the lodge at night, the least interesting of which was this baby Common House Gecko (Hemidactylus frenatus). 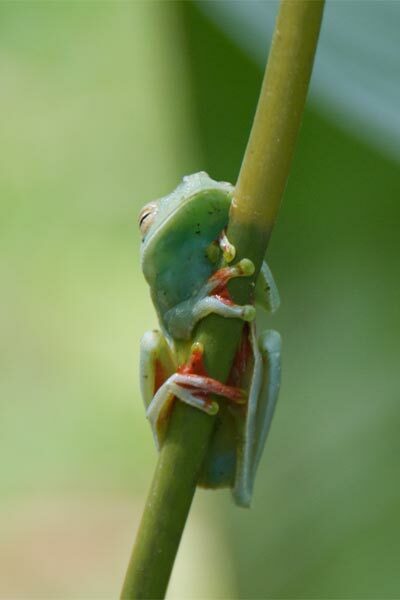 One small step up on the ladder of interestingness was this rain frog. I'm pretty sure this is a Common Rain Frog (Craugastor fitzingeri). 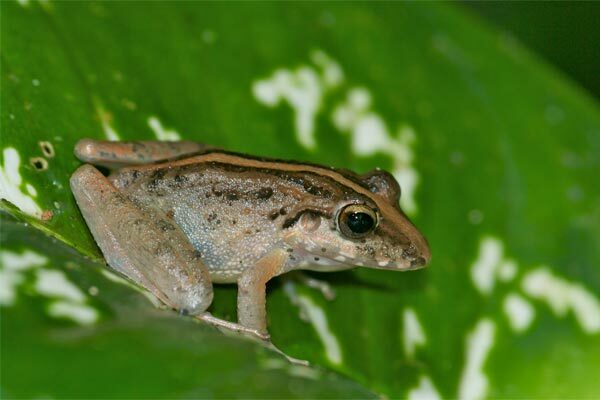 But maybe it's some other Craugastor; please let me know if you have an opinion. We only saw a few snakes, so each one was special. This little guy goes by a variety of amusing names. My favorite is Cloudy Snail Sucker (Sibon nebulatus). Our next destination after Tortuguero was the Sueño Azul Resort near Braulio Carillo National Park (and La Selva Biological Station). It had some beautiful catered grounds, but also a lot of wild space. 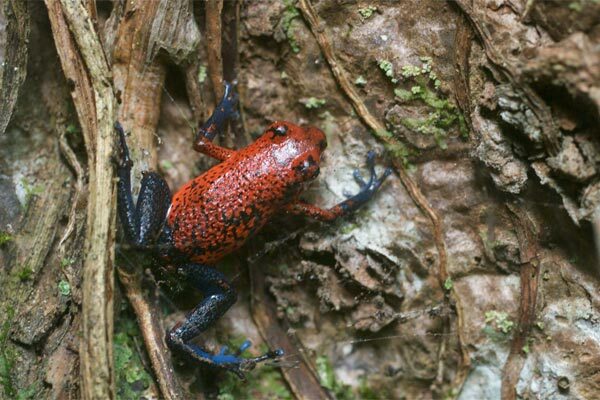 We saw these little Strawberry Dart Frogs (Oophaga pumilio) in several places, and certainly saw more of them than any other frog species. 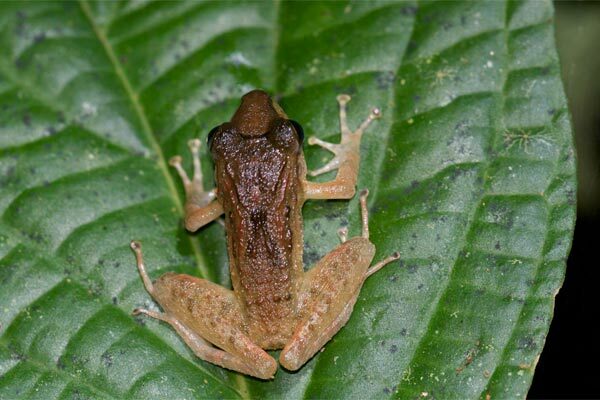 At Sueño Azul, each room in our row had one or two of these frogs living just outside. Unlike nearly all of the other frogs we saw, the dart frogs were often active during the day. 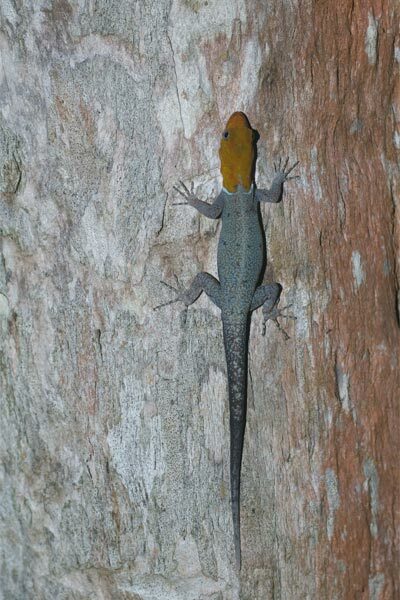 Sueño Azul also featured a healthy population of Yellow-headed Geckos (Gonatodes albogularis), all of which had orange or red heads. Well, the males did anyway. Here is a male and a female. A big brown lizard on the grounds of Sueño Azul. 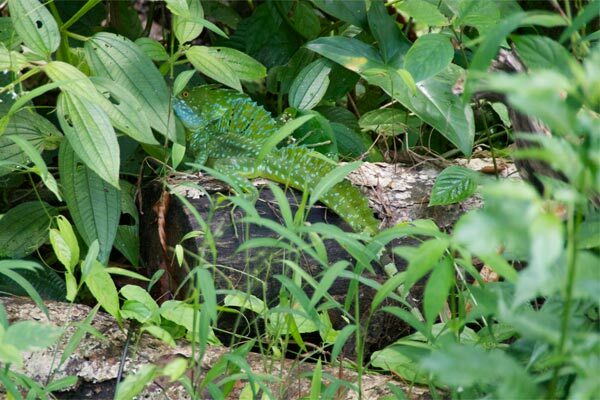 At this location, the Brown Basilisks (Basiliscus vittatus) were mixing freely with their emerald cousins. Speaking of which, here's a young one showing off how well it can hide on a grassy lawn. 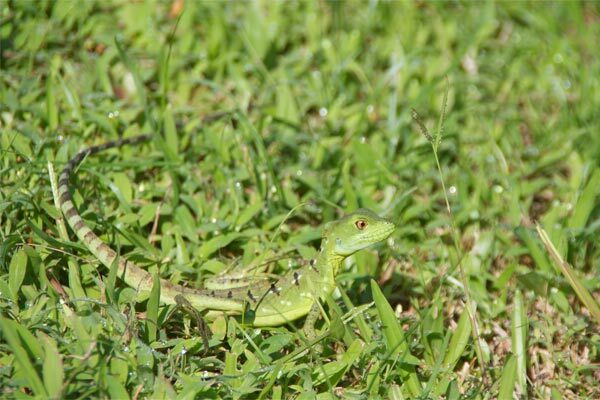 And here's a very big green lizard. I saw it moving out of the corner of my eye and thought it was an adult iguana. I only managed to get this one photo of it just before it crashed off into the foliage. I called this one the Hulk. Near the Hulk there were a few Central American Whiptails (Ameiva festiva) hanging around, no doubt feeling jealous that they aren't as fantastic as the basilisks. Wandering about Sueño Azul at night was a decent way to find frogs. 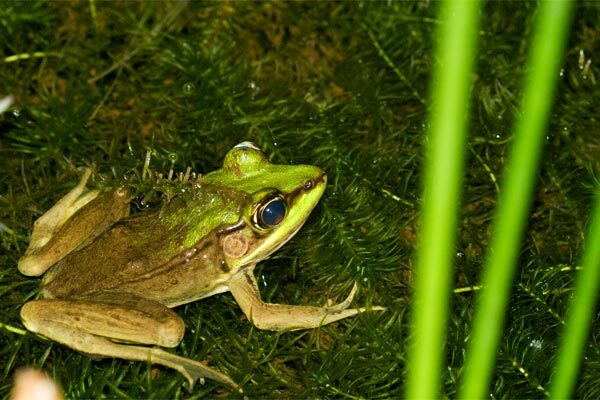 One pond was populated with Vaillant's Frogs (Lithobates vaillanti). 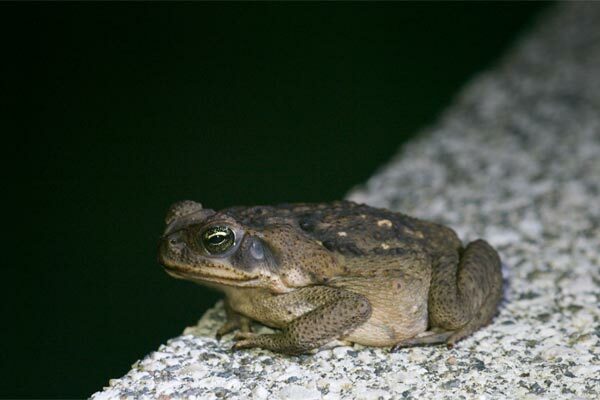 The pool's edge was carefully guarded by this Marine Toad (Rhinella marina). Having recently been in Australia, it was odd to see these guys in an ecosystem that they weren't devastating. 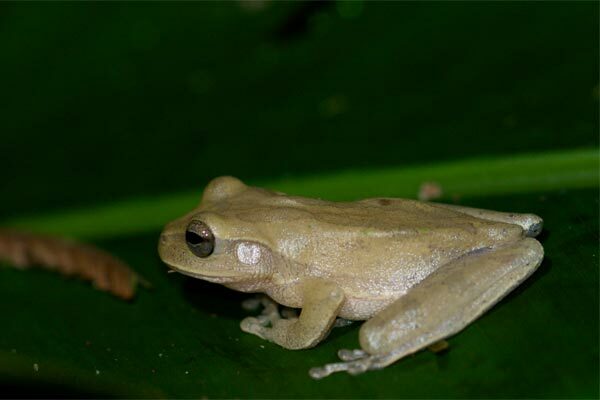 I'm pretty sure this one is the relatively uncommon Tawny Treefrog (Smilisca puma), based on its very faint cross-bands and occasional small green spots. This one is a very typical-looking Craugastor fitzingeri, complete with the usual (but not ever-present) dorsal stripe. I could use some help on the identify of this little frog that was approximately an inch long. 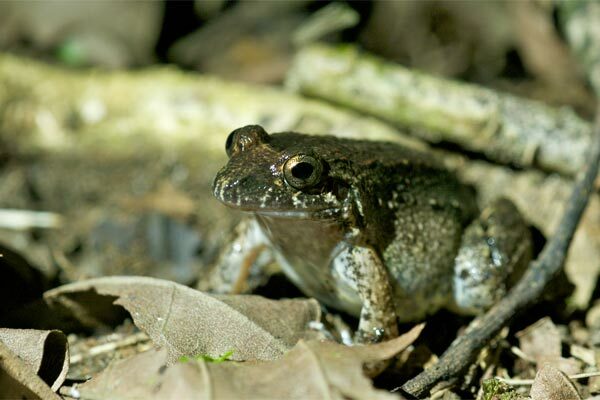 My best current guess is that it's a young Craugastor fitzingeri, but I'm not at all confident about that. 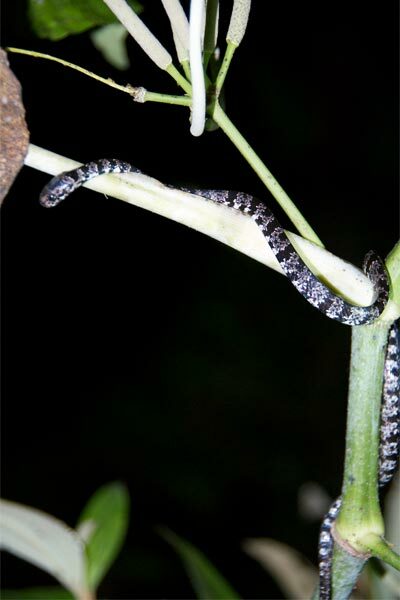 We didn't see any snakes at night at Sueño Azul, but we did manage to find a couple of sleeping basilisks. 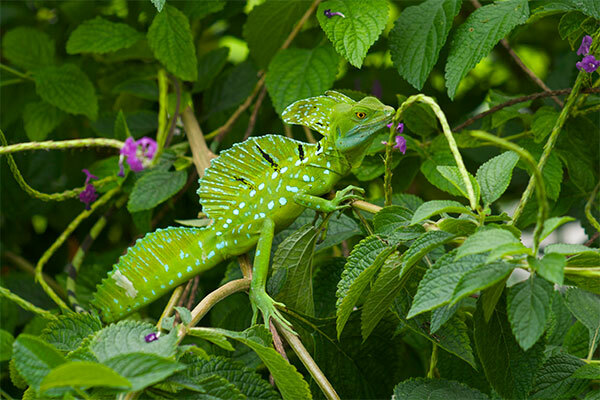 And speaking of basilisks again (which it seems I keep doing), my hope of getting a good shot of a big male B. plumifrons was finally rewarded with this beauty that was keeping an eye on us as we ate lunch on an outdoor patio at Arenal Springs Hotel, within view of Costa Rica's most famous active volcano. After our basilisk-festooned lunch, we spent a couple of hours at the Arenal Hanging Bridges, a beautiful hunk of rainforest with a number of footbridges of various types (including, of course, the hanging ones). Here we hoped to see a lot of wildlife, as this had been a real hot spot for Jonathan in the past. Unfortunately, the weather didn't cooperate that day, and most of our time was spent in drippy rain, and most of the animals stayed hidden. 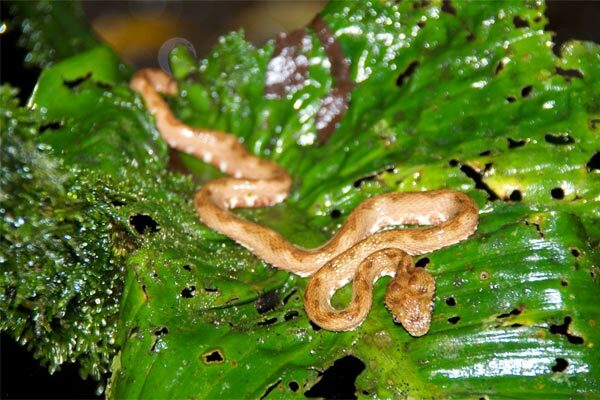 Fortunately, one animal that did not stay hidden was this little Eyelash Viper (Bothriechis schlegelii), which Jonathan spotted from at least a hundred feet away. 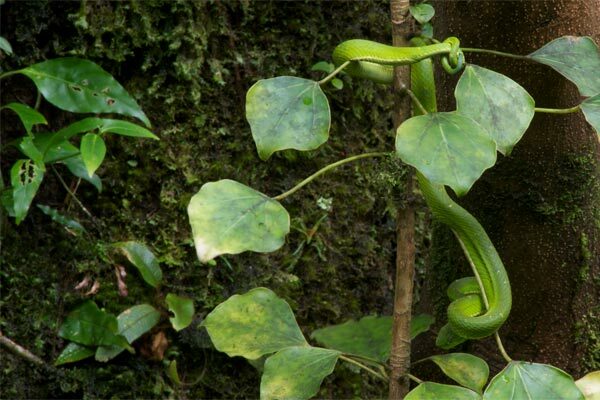 I had managed to avoid seeing any of these in my previous two trips to Costa Rica. We did see one at Tortuguero, but it was at night when we were out to see the turtles, and we weren't allowed to have cameras with us. So this was my first chance to take a photo of this common but excellent species. A couple of feet away, I noticed a tiny ghostly anole on a post. 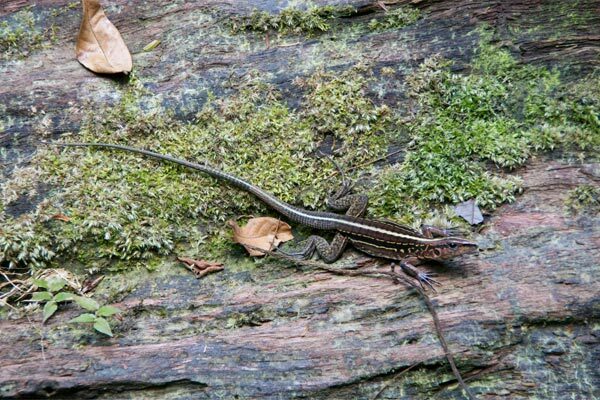 This turned out to be the only other herp we saw at the Hanging Bridges. 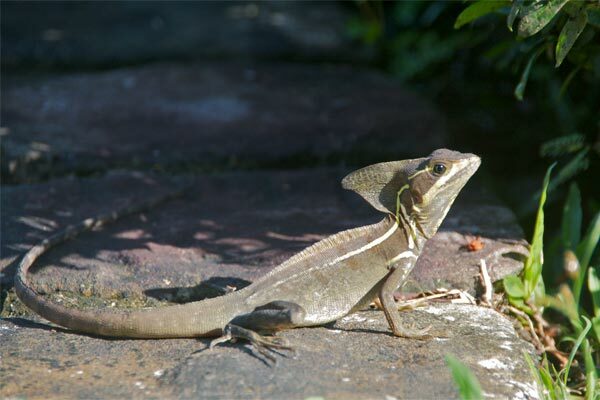 The lizard was no more than two inches long from snout to tail tip. 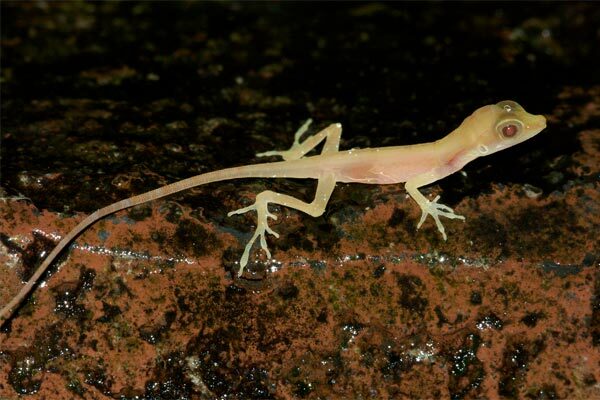 I haven't been able to find any photos or descriptions of tiny anoles that look like this. Perhaps it's amelanistic or even albino? 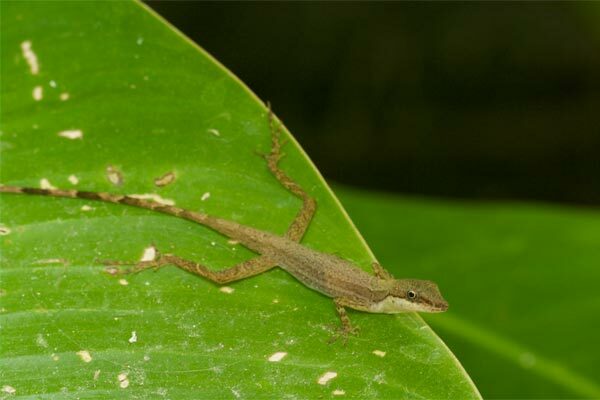 Its little pug nose makes me think it might be a hatchling Big-headed Anole (Norops capito). Can anyone confirm or deny this guess? 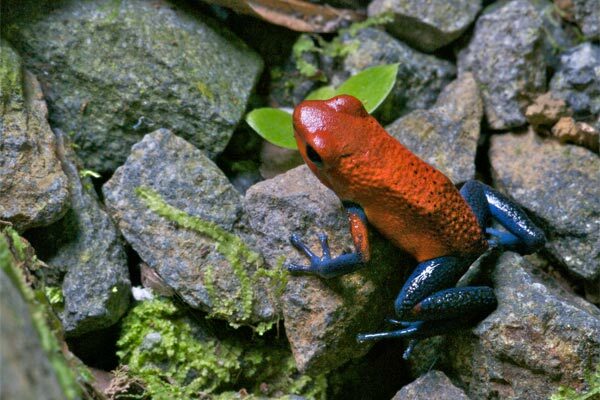 We saw a few more frogs at a pond near the hot springs featured in the title of our hotel, including a pair of Costa Rica's signature Red-eyed Treefrogs (Agalychnis callidryas) in amplexus. 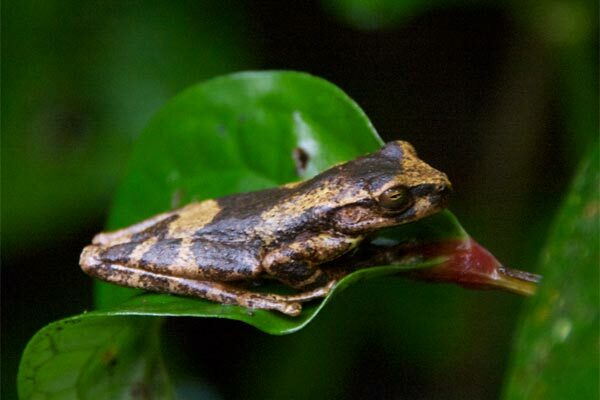 Nearby was an earnest-looking Narrow-headed Treefrog (Scinax elaeochroa). 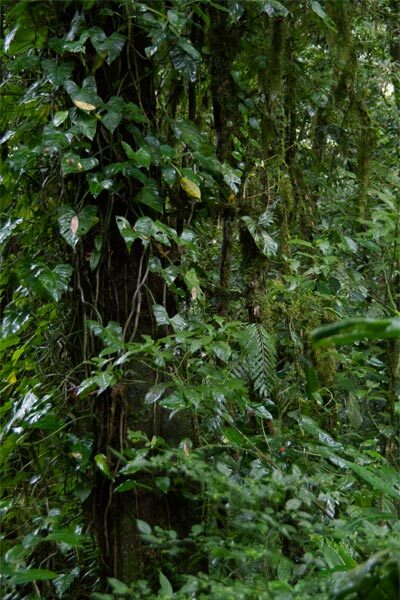 Our final destination was Monteverde Cloud Forest. On our way up the mountain, we took a tour at a small coffee plantation. 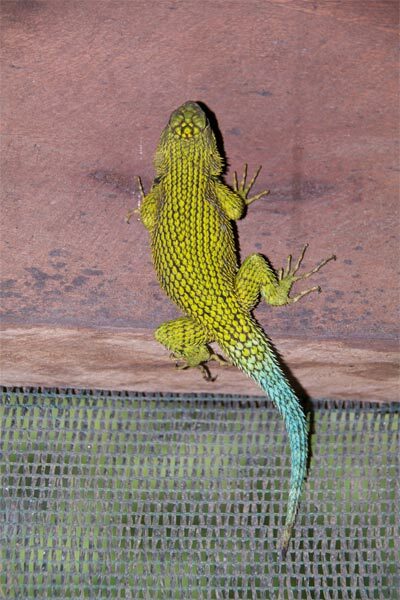 One of the highlights of the tour, at least for me, was this strapping Green Spiny Lizard (Sceloporus malachiticus), which was spectacularly failing to be inconspicuous. 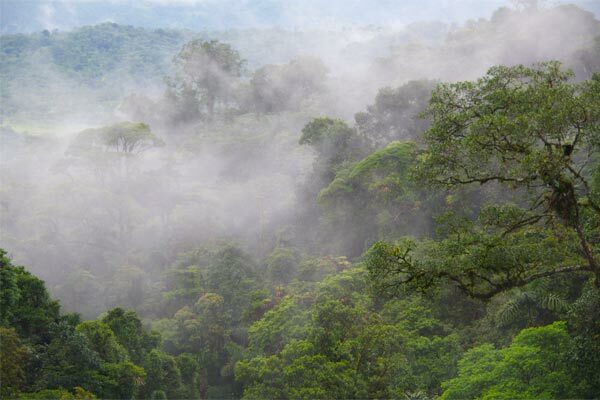 Monteverde was green, dense, and wet, which is about what one should expect from a rainforest. 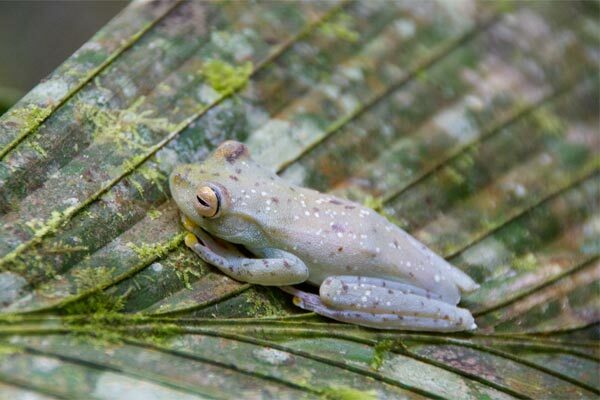 This sleeping Gunther's Costa Rican Treefrog (Isthmohyla pseudopuma) would probably have been very well camouflaged if it had chosen something brownish to rest upon. Not too far from the frog, my mom spotted the only lizard that bothered to put in an appearance for us on this drizzly morning. I'm pretty sure that this is a Blue-eyed Anole (Norops woodi). Please let me know if you think otherwise. And last but certainly not least, the hummingbird garden at Monteverde had an unwelcome guest in the form of this Side-striped Palm Viper (Bothriechis lateralis). Well, it was welcome to me, but certainly not to the hummingbirds. They knew full well it was there, and various hummingbirds continually buzzed it in a vain attempt to get it to relocate. But the viper knew a nice buffet when it found one, and had no intention of leaving.